Top row: James Prosek, Peacock and Cobra, 2013; William Giles, Sic Transit Gloria, c. 1924; Brian Stephens, Sing something here, 2014. Second Row: Laurel Roth Hope, La Reina, 2013; Vladimir Pavlovski, Peacocks, c. 1925; N.C. Wyeth, Captain Nemo, 1918. 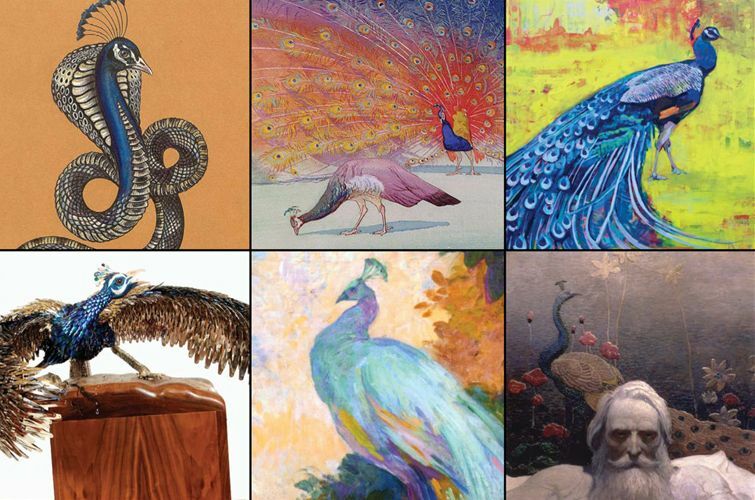 Yonkers, NY -- Strut: The Peacock and Beauty in Art explores our fascination with this most glamorous of birds, a symbol of vainglory and the darling of designers and painters. Strutting in its sapphire-blue and emerald-green feathers, the peacock symbolizes all things vain and beautiful in centuries of painting, sculpture, in books and myth, and on clothes that swirl and shine like the iridescent bird itself. Intrigued by the exotic art of Asia that prized and portrayed the peacock, Western artists and craftsmen chose the peacock as a multi-faceted motif for designs on canvas and for objets d'art in the home. Robert Henri, Ruth St. Denis in the Peacock Dance, 1919. The Hudson River Museum presents Strut: The Peacock and Beauty in Art from October 11, 2014 through January 18, 2015. Organized by the Museum, it is the first scholarly survey of the peacock in art. Paintings and decorative objects for the home present concepts of beauty symbolized by the luxurious bird and its famous fan of feathers from the 19th-century's Gilded Age and 1920s Art Nouveau and Art Deco until Modernism's ethos of "less is more" caused a brief decline in the peacock's popularity. As the contemporary art world re-embraces beauty in a new "Gilded Age", the peacock struts its way back into the art world. Among the highlights of The Peacock in Beauty and Art are images of women bedecked in peacock feathers, such as Robert Henri's full-length portrait of Ruth St. Denis in the Peacock Dance, 1913, William Baxter Palmer Closson's Feeding the Peacocks, 1910 and Aubrey Beardsley's The Peacock Skirt, created for Oscar Wilde's Salome. The bird itself receives its own glamorous portraits in paintings like Louis Rhead's Peacocks, 1897, Jesse Arms, Botkes' Black Peacock, c. 1930, and sculptures like Anna Hyatt Huntington's Peacock's Fighting, 1914. Peacock feathers are extracted into beguiling geometric patterns in the lamps of Louis Comfort Tiffany and gilded Crown Derby porcelains. The peacock also appears to whimsical effect in parade costumes, pictures of Elvis, strutting peacock-style, and images of silent-era Hollywood starlets ready for their close-ups. The peacock's origins as a bird of the Indian jungles comes to the fore in Charles R. Knight's (famed for his murals at the American Museum of Natural History) fearsome Bengal Tiger and Peacock, 1928. Contemporary artists show the peacock's gift of line - Laura Ball, Barbara Takenaga, and Federico Uribe find inspiration in the bird's striking feathers, brilliant coloration, and the sensuous s-curves of its body. Two Westchester based artists highlighted in the show are Tricia Wright from Irvington and Dillon Lundeen Goldschlag from Tarrytown. The exhibition includes works from more than three dozen museums, galleries and private collections, including the Metropolitan Museum of Art, Smithsonian American Art Museum, the Pennsylvania Academy of Fine Arts, Yale Center for British Art, and the Two Red Roses Foundation.